DrScream2 wrote: "Hey, I would need to what are the best vines for covering a fence. I have a 9 foot, chain-link fence in my backyard, and I would like to cover it with vines. 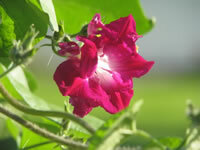 I am interested in flowering vines that grow fast and attract hummingbirds and butterflies. I already have yellow, orange, and red Honeysuckle, but they don't grow very fast." I suppose that Clematis plants or Passion Flower Vines would be too slow as well. 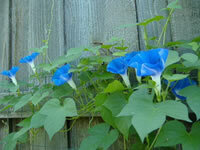 If you want to cover your fence FAST, the best choice would probably have to be Morning Glories. Morning Glories are very fast growing plants, that depending on the species, may be annual or tender perennial vines with light green, heart shaped leaves. sometimes fragrant flowers from early summer until the first hard frost. Each flower only lasts for a single day or night. The Moon Flower, Ipomoea alba is a night blooming species with fragrant white flowers. Moon Flowers may also open on overcast days. Morning Glory flowers will attract both hummingbirds and butterflies to your gardens. and will rapidly cover your fence the next spring. 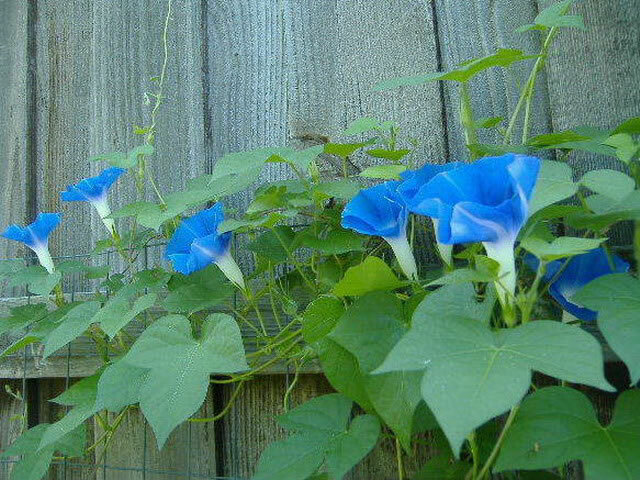 Morning Glories should be planted in an area where they will receive full sun for most of the day. Morning Glories thrive in conditions that won't support most ornamental, landscape plants. stimulate production of lush foliage but with very few flowers. Fertilizing should be kept to a bare minimum for the same reason. stem cuttings taken during the summer months. in room temperature water for 24 hours to soften the hull. after all danger of frost has passed in the spring. Start your Morning Glory seeds indoors, 4-6 weeks before your last killing frost. Morning Glories resent transplanting, so for the best results, plant the seeds in 3" peat pots which can be dropped in the garden without disturbing the roots. Maintain a temperature in the growing medium of 68°-86° until germination, which only takes 5-7 days.